Oh Mademoiselle Eliza Lily, are you a real princess? Are you a temptress? Are you a mysterious girl from lands afar? Who are you? 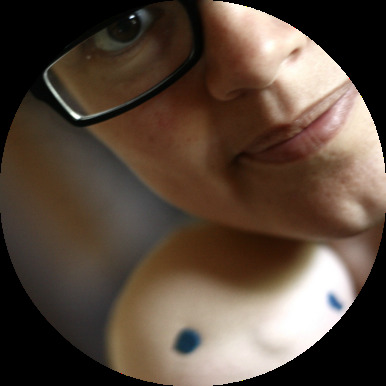 - I ask her, with needle in hand, messy hair and inquiring look. I am who I am. A girl who, to begin with, doesn't like to be questioned first thing in the morning, thank you kindly. But, tell me, why do you not know who I am? You are who brought me forth, you are my maker, surely if there is anybody out there who knows me it is you. Or do you not? - responds most accurately this little bundle of mystery. Well, you know, you are positively right. I do know who you are, sometimes I like to circle the thing, trying to find the answers to my own questions, knowing fully well that I know them in advance. I think you speak to me in the language of my craft, and that is why you took me off base. Yes, yes, the language of my craft. The international language of a doll maker. You speak of gathers and pleats; ric rac and lace; linen and cotton; stuff the arms, baste the legs; roll the head, weft the hair; round the thumbs, dart the torso; turn the heel, trim the seams; press the neckline, sew the buttons; chain ten, hem the skirt. Full of treasures you are. A vision of pink and pastel, of lace and copious amounts of fabric. I hear you will be your Mother's favourite. Is that so? Well, I am happy to hear that, I truly am. After all is said and done Eliza, I do want you to know that I love you. Seeing your face makes me happy. Passing my hands over your dress makes me feel proud and also excited. I know you will have a lot of fun, for years and years to come. I do wish you write sometimes. Yes I know, your bag full of treasures will not be left behind. I promise to pack it with the rest of your clothes. Yes, I still have to finish your petticoat, but I have to go away for a few days, you will be here...don't you? Alright, let us go and finish your petticoat then. 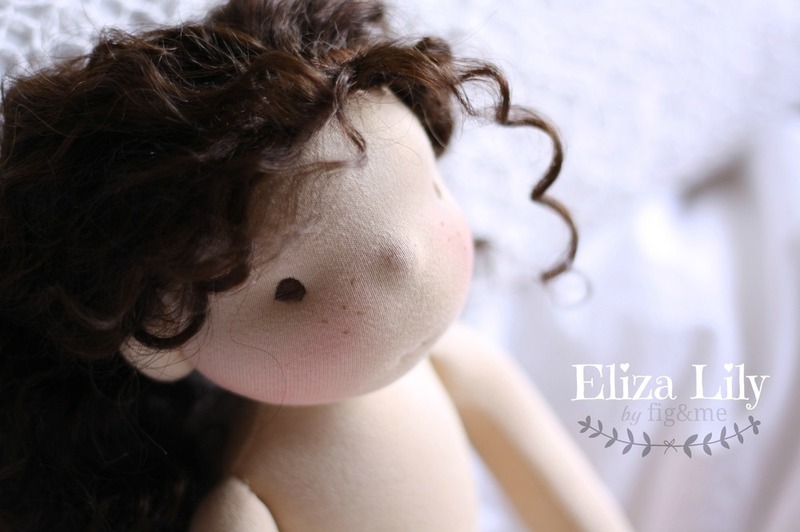 Eliza Lily is a custom 18" figlette made for a woman that has opened my heart to a world full of words and magic. 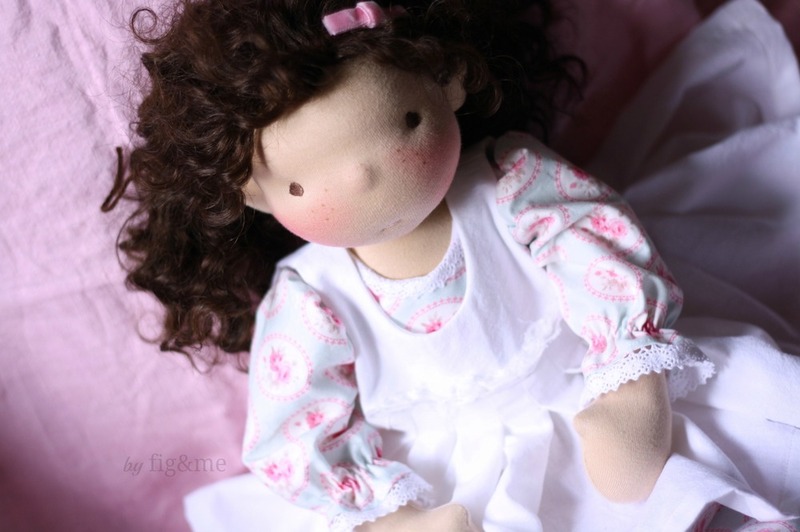 Reading her life history has made me very conscious of the place I partake when I create dolls for healing and play. Eliza Lily will be a treat for her, but also a tribute to her struggles and hopefully an encouragement for her to wake up to sunny days. May she bring you light and laughter, with her wood shaving curls, her lace bonanza, her spattering of freckles, her princess demeanor, her bag of hoarded treasures, her soft arms and cute smile. It was a pleasure making her for you, thank you. Jul 17 A fruity pair.